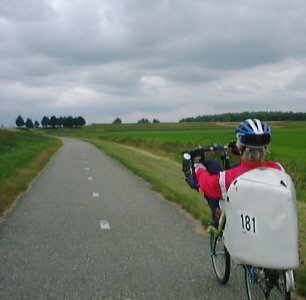 The Dutch Bike Bits blog includes comparisons and reviews of cycling components. 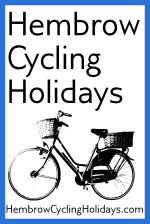 The Hembrow Cycling Holidays blog has stories about cycle routes in Drenthe. We organize Study Tours to show off the best cycling infrastructure in the world. 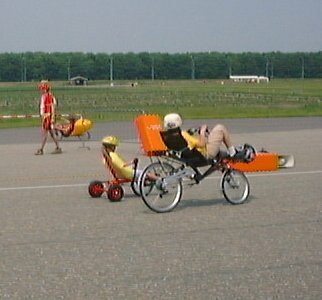 Back in 2002 it seemed a very good idea to make our way to the Cyclevision event which was held at the RDW test centre near Lelystad in the Netherlands. The event was held over the weekend of Friday the 28th of June through to Sunday the 30th. A bit of planning determined that it would be possible for a group of us to take time off work from the Thursday to the Tuesday so that we'd be able to cycle and take the ferry for the entire journey. 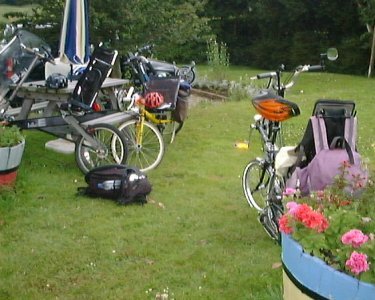 It turned out to be possible to take the overnight ferry with our bikes. This provides a buffet evening meal (at nearly midnight) and a buffet breakfast (at about 6 am) both of which we felt we could do justice to as cyclists ! 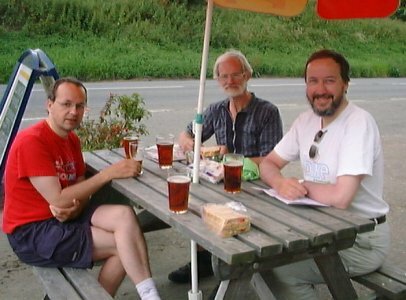 The intrepid group from Cambridge ended up being Simon Nuttall, Ian Miller, Mike Sleep and myself, David Hembrow. Terry Clark was already in the Netherlands so was to join us at Hoek-van-Holland as we left the ferry. 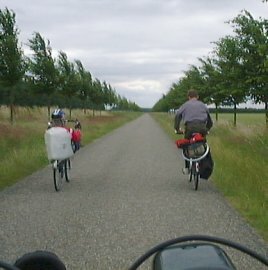 We were riding an assortment of different bikes: Ian on his Brompton (with Julianne Neuss recumbent conversion), Simon on his Bike-E, Mike on his Speed Ross, myself on a Speed Ross and Terry was to meet us on his Raleigh 20 (which being a vouwfiets, or folding bike, travels for free on the Dutch trains). I bought the relevant Ordnance Survey maps to plan the route in the UK and spent a while marking them with a highlighter pen along what seemed the most sensible route, mainly using minor roads between Cambridge and Harwich. My bike was quite new, I'd just built it from a frameset a couple of months previously having managed to break my previous Speed Ross last year (at the HPV world championships in Brighton). 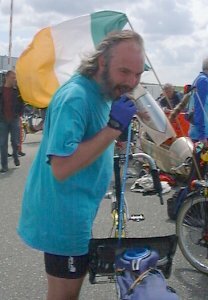 I'd been racing a couple of times with just a close ratio 5 speed block on my bike, but an exploratory ride half way to Harwich and back when planning the trip to Lelystad had convinced me to change to a wider range block with 7 gears. I also fitted lights and a rear mudguard as I was concerned that otherwise I'd get a wet back through the mesh seat. Apart from a once over, checking nothing was lose, oiling the chain, pumping up the tyres etc. I was ready to go. Note that having finally learnt my lesson about the fragility of IRC roadlite tyres the year before, I had a Primo Comet fitted on the front of this bike. I found it to be an excellent tyre. 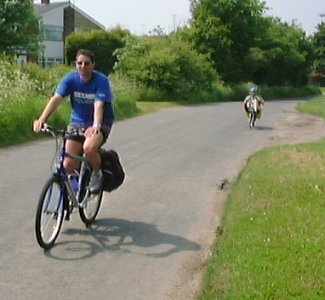 An early start, and Judy took a photo of me as I left from St. Albans Road. We all met at Ian's house in Stockwell Street, that being the one closest to the South East of Cambridge which seemed the most logical place for us to start. We had roughly 70 miles to cover to get from Cambridge to Harwich, but we had all day to do it - the ferry wasn't to sail until about 11pm. This meant we had plenty of time to stop for drinks en-route etc. 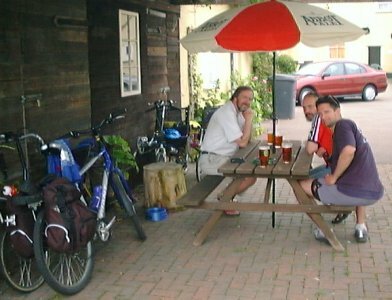 While our bikes drew odd looks at the pub we had beer for lunch ! Nothing like it for "carbo-loading". The route I recommend from Cambridge to Harwich, which is a slight modification of the route we took the first time is: Fulbourn, Balsham, West Wickham, Withersfield, Great Wratting, Keddington, Brockley Green, Chilton Street, Clare, Pentlow, Foxearth, Rodbridge Corner, Acton, Great Waldinfield, Edwardstone, Boxford, Polstead, Lower Raydon, East Bergholt, Lawford, Manningtree, then the B1352 to Harwich. 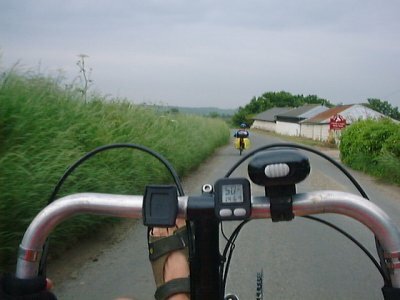 This route is mostly on minor roads, but it is impossible to completely avoid busy roads when cycling in the UK and the roads can be quite unpleasant at either end of the journey. There are no cycle paths to help with this journey. Left to right on their bikes: Ian Miller, Mike Sleep, Simon Nuttall, and Ian next to the Boxford sign for the benefit of his brother in Boxford, Massachusetts. Unfortunately, Ian was not able to join us on the rest of the trip, but took the train back to Cambridge. The other three made the ferry on time, ate an enormous amount at the buffet, had a couple of extra beers and slept very soundly until the klaxon in our room woke us the next morning at about 6 am. Friday started with the previously mentioned klaxon, followed by a huge buffet breakfast as the ferry came into Hoek-van-Holland. We got off the ferry and Terry met us at the port. Luckily with Terry being almost a local, we now had a navigator for this part of the journey. 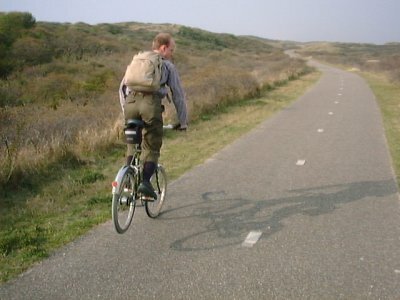 Then we were off and riding up the excellent coastal LF1 path - which forms a part of the North Sea Route. 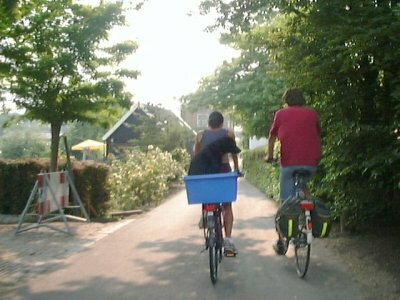 In contrast with the UK part of the ride, we were on good quality cycle paths for virtually the entire time that we were in the Netherlands. From Den Haag, Simon decided he'd take the train today but the rest of us continued on our bikes. The final few km into Zandvoort were covered in no time at all as I'd tagged onto a group of roadies out for a fast ride through the dunes. We stopped to regroup and eat pizza in Zandvoort then rode through Haarlem, Halfweg and Amsterdam. After Amsterdam we rode further east, into Flevoland, skirting around Almere and up the coastal path alongside the Oostvaardersdijk to Lelystad. 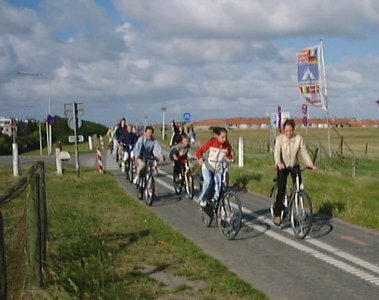 A shoal of Dutch school-children on their way to school & Terry demonstrating a stoppie. Both photos taken along the LF1 path where it passes through sand dunes near the coast. On a visit in 2006 I found that this already excellent path had been upgraded. 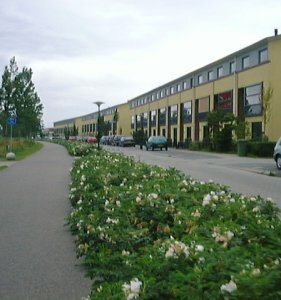 Paths of this sort of quality seem to go virtually everywhere in the Netherlands. We barely touched a road while we were there. Terry's bike is in pretty much original condition here, but later he modified it and I made a basket for it. 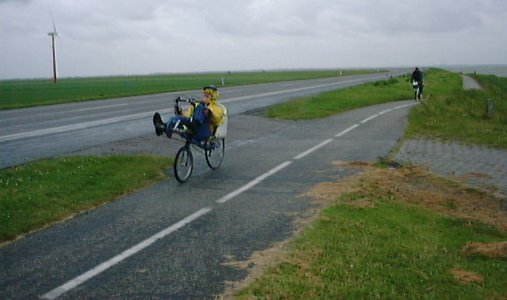 Later on along the Oostvaardersdijk in Flevoland. By this stage the weather had turned terrible. Note the bending of the wind turbine blades due to the wind, which was of course against us. We were soaked, the wind being strong enough to be picking up the water from the lake and throwing that at us as well as the rain. Perhaps the odd thought went through our heads that we wished we had joined Simon on the train ! That last minute addition of a mudguard now seemed like a remarkably good idea. A short note about the wind turbines. There is a lot of concern in the UK that such turbines are noisy or otherwise somehow destructive to the environment. Some of these were very close to the path and spinning around at a fair speed due to the heavy weather. They were not particularly noisy. Cars going along the road easily drowned out the noise of the turbines. 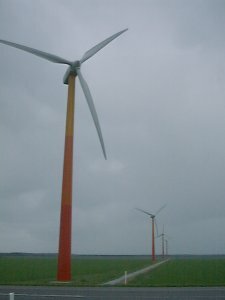 I've been close to such turbines a few times and never found them to be particularly noisy. I like their appearance too. A little later than expected we arrived at Pension De Lange Jammer, Lelystad-Haven where we were booked in. Simon was there to great us, told us that the layout was similar to Milton Keynes where he used to live and showed us the way into the centre of Lelystad and a great Vegetarian Chinese restaurant, The Yuan. They fed us very well indeed. I should point out that De Lange Jammer, our home for the next few days, is quite an interesting place. It was built on an island to accomodate the workers who drained Flevoland, which was actually sea bed until well into the 20th century. Accomodation perhaps a bit basic when we went, but it looks to have been completely rebuilt recently. Including the ride to the restaurant and back we covered about 100 miles today, largely in horrible conditions. 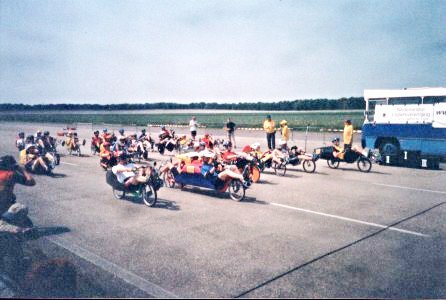 The first day of racing. In order to maximise the value for money aspect of the journey, I'd entered myself for more or less everything that I had the right bike for. Others had done similarly. We got up, had a typically Dutch breakfast and set off on our bikes. Well, eventually we did. I found that yesterday's weather had removed all traces of oil from my now orange with rust and very squeaky chain, but luckily another person staying in the same place (and riding a Leitra) gave me a little oil. We rode along the marvellous bike path out to the test track where Cyclevision was held and found more "odd" recumbent bikes than any of us had ever see in one place before. Quite a lot of other Brits who we knew from the BHPC (British Human Power Club) were also there competing. Simon replacing a tyre which suffered a blow-out. 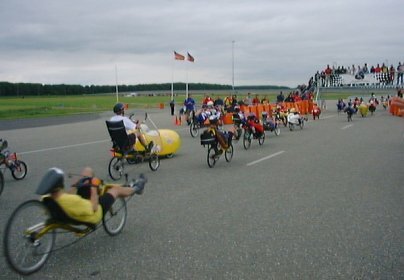 Riders preparing for the 200 m flying start sprint. The 200 m sprint was the first event that we entered. Simon Nuttall and I took part. 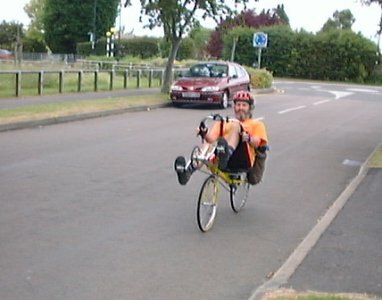 Having done this only once before, at the World Championships in 2001, it was still remarkably difficult to arrange to be riding at the highest possible speed at the right time. Simon came 136th with 43.71 km/h and I made 106th with 52.63 km/h. This is pretty much what we'd expected, as lower or faired bikes should go very much faster for the same expenditure of effort. Nice as it might seem to dream of medals, we didn't for one minute expect to beat the fast people on fast bikes. The entire thing was about fun. 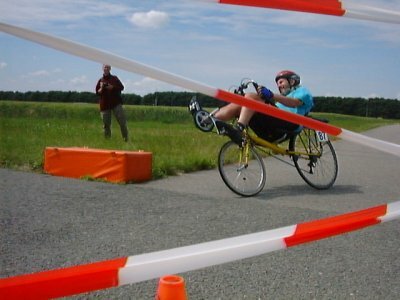 The first place was taken at a speed of 79.43 km/h by Jurg Birkenstock. Britain was represented well by Ian Chattington coming 4th at a speed of 74.91 km/h. The world record is an incredible 129.6 km/h by Sam Whittingham. It should be noted, though, that this record was set on Battle Mountain, well above sea level where the air is thinner. Not below sea level at Lelystad ! The low altitude record is just over 100 km/h (also by Sam Whittingham). Ian Chattington finishing fourth for Britain. Mike Sleep waiting at the start of the Criterium. The Criterium races were next. Mike and I both entered for this, but unfortunately Mike had to abandon his attempt due to still feeling the effects of yesterday's ride. I was out in the first round, but enjoyed the race. Before, during and after the criterium. 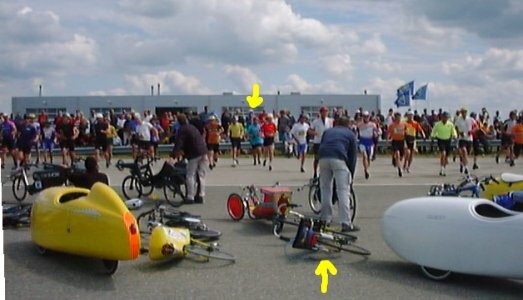 The 3 hour race had a "Le Mans Start", so here we are running towards our bikes. 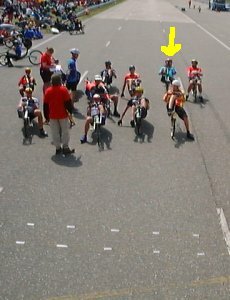 One photo during the race, and after 3 hours. I'd covered 97.18 km in the allowed time, which put me in 109th place. 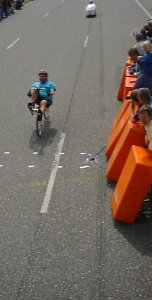 First place was taken by Walter Berger who covered 172.18 km. Click here for full results of the races. After this exertion we had a good look around the various stalls and then we returned to our accomodation for the night and went for dinner. Views of the excellent bike path between Lelystad and the test track. We rode along here for about 12 km to get to the track. On Sunday, Simon and I were both supposed to be entering the 1 hour race. I didn't feel like entering this today, but Simon entered and covered 28.56 km. After this race we pottered about a bit looking at bikes and then started heading home. Simon took the train to friends in Amsterdam while the other three of us rode towards our accomodation for Sunday night. This was booked through the VVV (tourist office) in Almere and we were staying in family homes. 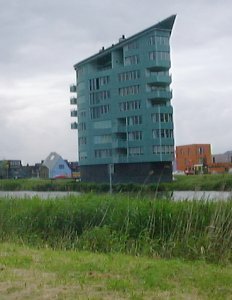 Bike paths heading south towards Almere, and unusually shaped buildings on the edge of Almere. 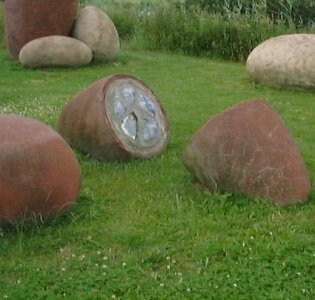 Unusual "Dinosaur Egg" art on the edge of Almere, and a typical housing layout. We had a meal and slept soundly in the homes of our very pleasant host families. On Monday we took the train to Amsterdam, met Simon, and did the culture thing for most of the day, walking around and visiting the Rijksmuseum before taking another train to Hoek van Holland for the overnight ferry. That worked much the same way as on the way out. I don't seem to have taken any photos of this day. Tuesday we rode back home to Cambridge taking very much the reverse route that we'd taken on the way out. An excellent adventure ended at home. Great as it is to have a bit of an adventure, the best part is always getting home to family. The next year it seemed a very good idea to repeat the adventure. Two friends from ACIS, my current employer, had heard me describe how much fun it had been and were keen to join me this time around. So, Justin Bloom and Nebojsa Jovanovic joined Ian Miller, who last year had to turn back at Harwich, and myself. This year the event was held over the weekend of the 30th and 31st of May. We set off at much the same time as before, and took the same route to Harwich. On the way to Harwich... 70 miles mostly through very pleasant countryside. Neb on the left, Justin on the right. 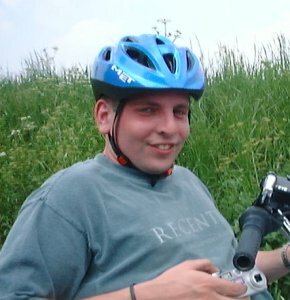 Justin regularly demonstrated the difficulties of smoking on a moving bicycle. I'm sure there's a market for a really good bike-mounted combined lighter and ash-tray. We took exactly the same route as last year from Hoek van Holland to Lelystad and stayed in the same accomodation. This time we had really pleasant weather for the journey, which helped a lot ! We covered about 100 miles this day. 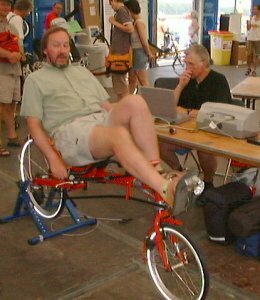 There were various things to look at in the show at Cyclevision including the opportunity to try out a bike fitted with equipment to meaure your power output over 5 minutes of struggling in stifling heat in a not very well ventilated tent. Ian and Neb have their energy output measured. The children's race includes kids of widely varying size and ability on bikes with widely varying qualities ! How do you pick a winner ? Anyway, Doria and Raban Stoll took first and second place, both managing 28 laps in 15 minutes. I entered the 3 hour race again, this year managing only 94.992 km, but that was enough for 54th place out of the 102 competitors, which was somewhat better than last year. I think it was a little more windy this year than last and that slowed everyone down. 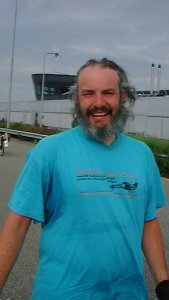 The winner was Dirk Henschel who managed 160.53 km in the same time. You can also see the full results and here's my average speed over time. I tried to not overdo it in the first few laps, but you can see it's a bit of a downwards trend over time. Also, there a sharp drop just before 1 and 2 hours when I was eating as I rode. I had a few snacks with me, a camelbak filled with water and a litre or so of energy drink. I also entered the criterium again, and again was out in the first round. Here are the results and average speed as before. Apart from the racing we covered around 8 or 9 miles each way to the track and a little less to get to a restaurant and back. As with last year we went to Cyclevision again before beginning the return journey. This time we were staying in the Vondelpark Stayokay hostel in Amsterdam. This meant splitting the 100 mile return journey over a relaxing two days. 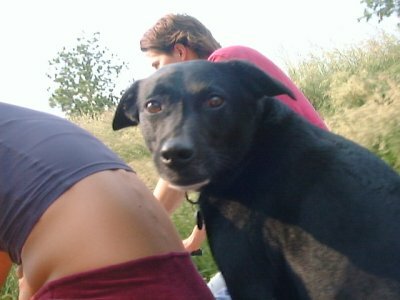 A dog enjoying a bike ride... Not part of our party. 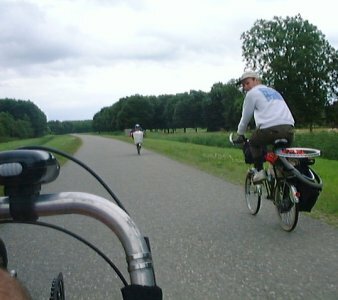 On Monday we rode from Amsterdam to Hoek-van-Holland. 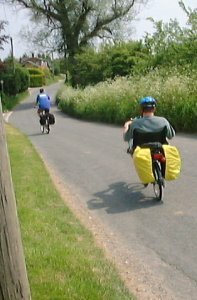 Instead of the coastal path we took an inland route and seemed to find the most bumpy cycle paths in the country ! I very strongly recommend the coastal route. 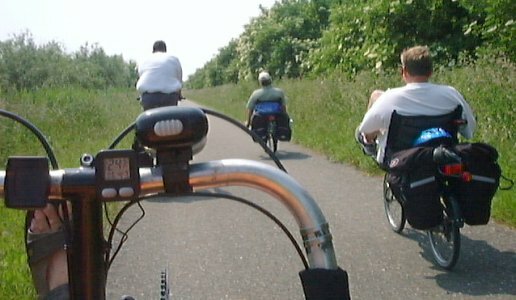 Don't do as we did but ride west to Haarlem, then Zandvoort and directly south on the nice smooth path in the dunes. A stop for a drink. Here some strange and unfathomable youth event was taking place. We rode on and got the return ferry in time and again made the best possible use of the buffet. Neb had disappeared the night before and gone clubbing until the early hours. 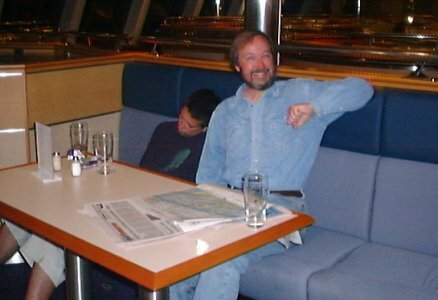 As a result, when we were on the ferry he fell asleep first. The ferry crossing turned rough. This had one great bonus - no-one else wanted their beer so I got extra. While Neb got an early start, I think I still slept the soundest due to the extra beer. 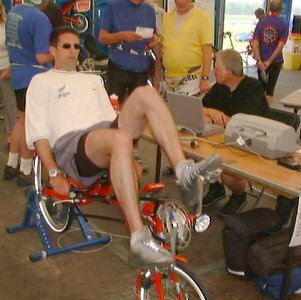 For some years I didn't take part in Cyclevision again. 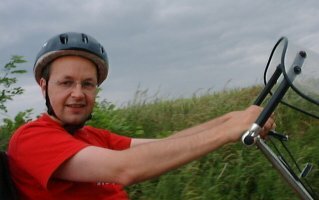 However, I started doing so again in 2009, with a better bike and better fitness. As a result, I'm quite a lot faster now. 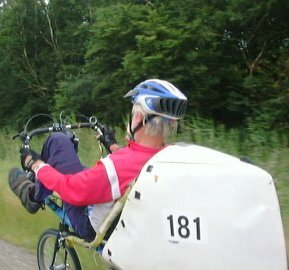 Further stories about other Cyclevisions can be found on my blog. 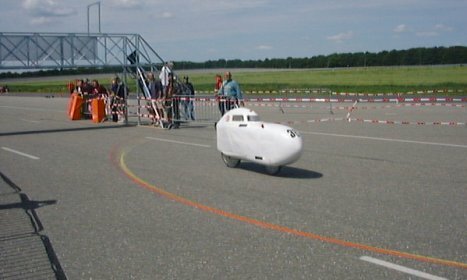 In this video, Ymte Sijbrandij sings the praises of the then new Mango velomobile. Yes, it's aerodynamic, it has plenty of luggage space and it's suitable for everyday use due to protection from weather. 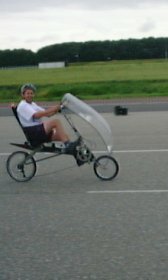 Since 2002 the design was sold to Sinner Ligfietsen and the design has benefitted from many improvements over the early models. 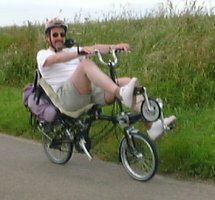 I now ride one myself. 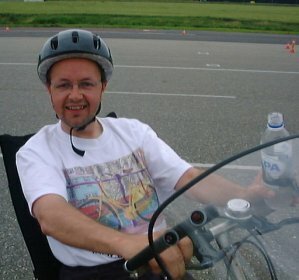 Along with Terry Clark (Cyclevision 2002), I rode from Land's End to John o'Groats in 2006. This was also an excellent adventure. 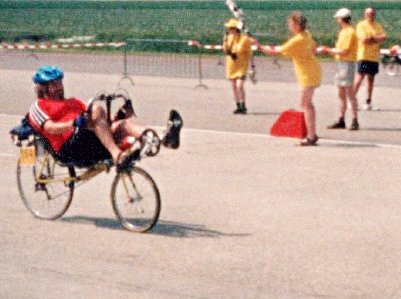 In 2001, Simon Nuttall and I took part in the HPV World Championships in Brighton. You may also be interested in a trip we made to a Dutch cycle museum. 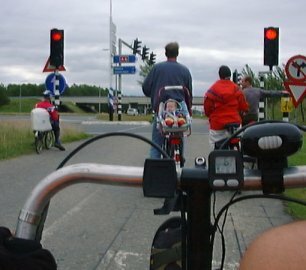 Or perhaps in a cycling holiday we had in the Netherlands with kids. 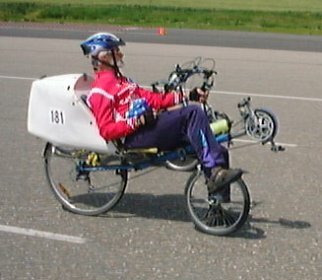 Back in 2000, my wife and I went on a recumbent cycle tour of Lincolnshire. 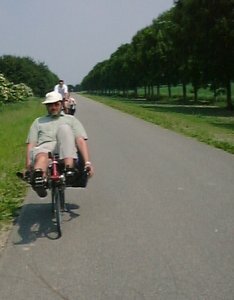 In 2007 we moved to Assen in the Netherlands and now run cycling holidays and cycling study tours from here. There is no better place to cycle. Here's the official website of cyclevision. 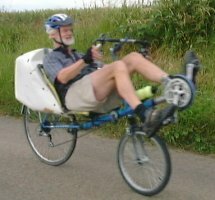 For more cycling stories, bicycle reviews etc. 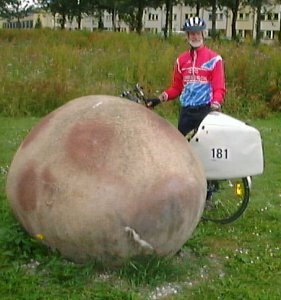 see the bicycles index. Photos were mainly taken by me with the Fujifilm DX-5 I owned at the time (very reliable but low res) or by someone else with that camera. Others by Ian Miller (or others) with his film camera.